A gorgeous 60 square, Georgian home is being built with style and flourish in Websters Road, Templestowe. The Finishing Touch are supplying a range of house mouldings to help achieve a stylised Georgian look. 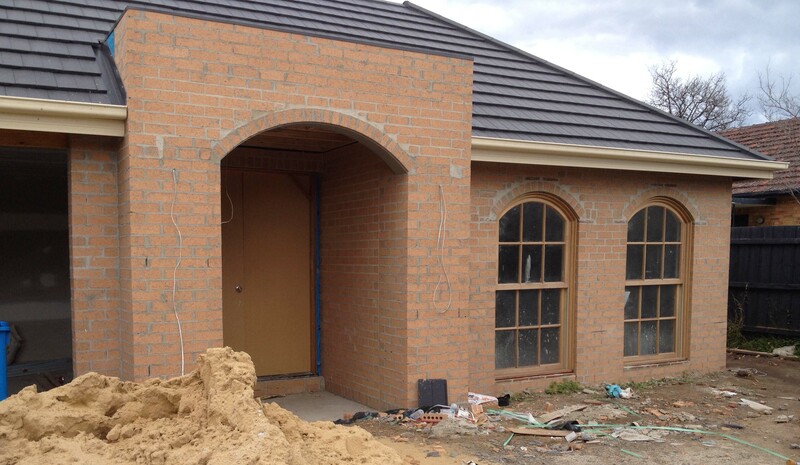 Mouldings for window arches, window architraves and window sills will decorate the windows. One hundred corbels have been used extensively whilst large parapets measuring 600mm high x 200mm long protrude outwards from the existing walls. Parapet and stringer combinations are another design feature along with one hundred and seventy five quoinings measuring 900mm wide x 600mm high x 50mm thick. Mouldings for four columns at the entrance make a grand statement, helping to form part of the tower feature. Custom made balustrades atop the tower and have been designed to match the style of the rest of the mouldings. The Finishing Touch can custom make mouldings to suit any style of building. A two storey high, 40 square home has been built in a modern design in Aranga Crescent, Donvale. 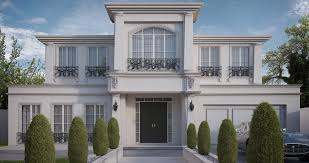 The Owner is now finishing the construction of the home after some years, with the addition of architectural mouldings to complete the building process. The addition of Parapets and window mouldings (architraves) and window sills has added a quality finish and elegant style to the house. The Parapets are flat band with chamfer at 150mm x 50mm thick in the sand grain finish range. The Finishing Touch supplied the majority of the mouldings to the Glenvill Homes Group who built a home in Cochranes Road, Brighton. The Owner has now requested fence caps and pier caps to match the existing architectural mouldings used to decorate the house. The new Finishing Touch range offers a smoother finish moulding, whereas the original range produces a rougher textured, sandgrain finish moulding. The smooth finish lightweight moulding is composed of an expanded polystyrene (EPS) core, reinforced with fibreglass mesh and coated with an impact resistant polymer modified cementitious render. The original range of sandgrain finish lightweight mouldings are manufactured from computer cut high grade EPS polystyrene, triple coated with a multi-part compound then reinforced with a triple coating of sand for maximum strength and durability. The mouldings are coated, sealed and ready for painting once installed. Another two projects under development are at Biltmore Crescent, Greenvale Lakes and Andrews Street, Windsor. 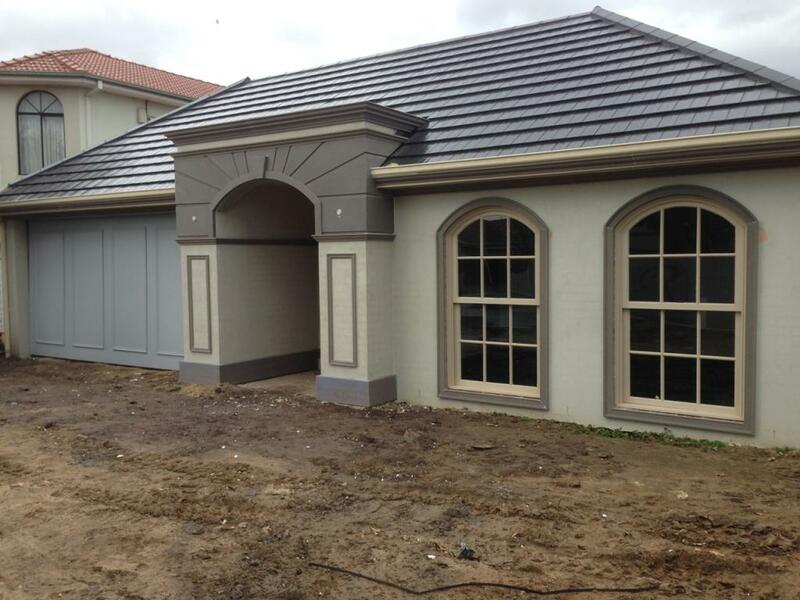 The Greenvale Lakes home is a single storey, modern style home and will attain a French Provincial look through the use of parapet mouldings and window architraves creating French influences. 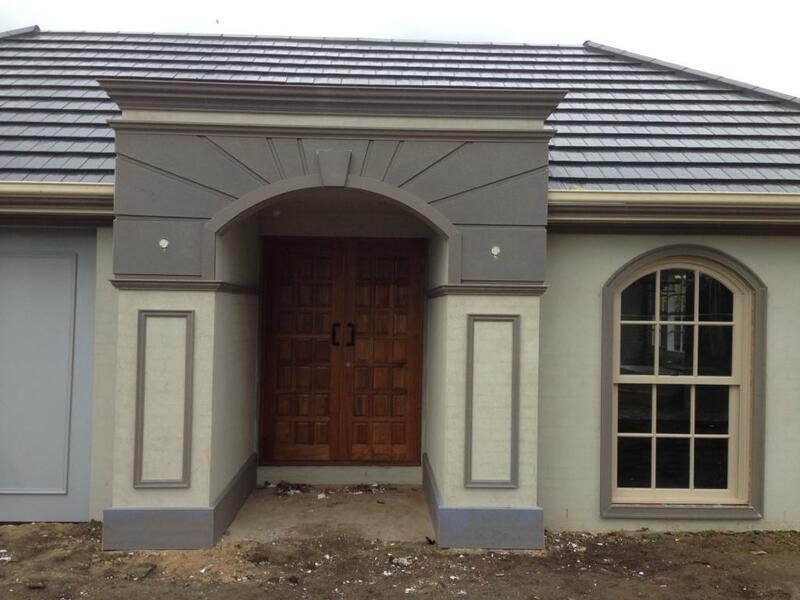 The property in Windsor is a single storey property in a post-modern style and will be decorated with parapet mouldings at the top, stringer mouldings just below and window architraves, creating an elegant finish to the property. The house at 8 Studley Road, East Brighton being restored (pictured) is greatly enhanced by the addition of lightweight mouldings from the Finishing Touch. As you can see in the before and after images below the addition of a quoining above the door and a parapet above the quoining create a grand, stylish entrance. The flat panels either side of the doorway with reset architraves and plinths underneath further achieve the overall stylish, modern look. Architraves around the windows and eave parapets complete the look. This is a great example of the decorative effect house mouldings can create. Exterior mouldings for the sixty square, double storey post modern home in Hall St, McKinnon, mentioned in our blog recently, have now been manufactured and will be delivered onsite this week for installation by the end of next week. The eave moulds, window architraves, window sills and stringer mouldings will complete the decorative finish to this build. Also mentioned in the blog, the decorative mouldings for the first level of the house situated at Francesca Street, Mont Albert North have now been manufactured. These will be also delivered this week for installation next week. Another project under development is at Whernside Avenue in Toorak. This double storey, post modern home needs pool fencing and rear fencing, which will take nine lengths of flat panel mouldings sized at 120mm x 30mm x 2900mm. Steve De Gregorio is working with a major regional Builder in the development stages for two to three different home designs for ongoing projects Victoria wide, which will have a specific inversion into inner city Melbourne. The homes will be single storey and of a modern design. The Finishing Touch range of mouldings will help create both French Provincial and Georgian styles for these houses. The regional Builder’s Designers are assessing the most appropriate and attractive mouldings in the Finishing Touch range to suit the company’s expansion program into inner Melbourne. A major tender for another well-known Builder has just been completed. It is for a multi-unit development in Malvern Rd, East Malvern, which will stretch over ten suburban house blocks. The development is three storeys high and will include offices and residences. The Finishing Touch decorative mouldings would be used throughout the complex. Creating a stylish finish with French influences. Another project being developed is for a home in Templestowe for a new client. The client, who is a Builder, will install the decorative mouldings himself. This Builder has selected the Finishing Touch mouldings, over his previous supplier, based on the quality, appearance and durability of the mouldings.